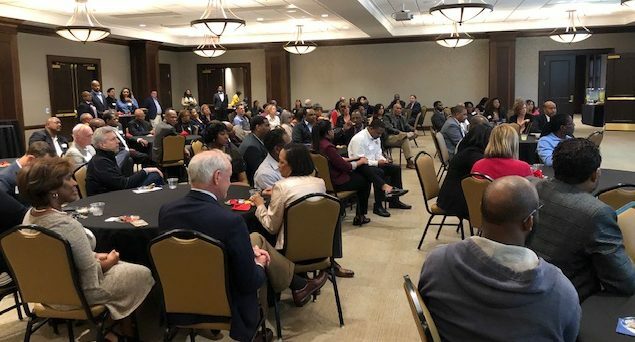 Belmont University recently hosted Metro Council’s Annual Minority Caucus Reception on campus March 14. The event featured many noted guests, including Nashville Mayor David Briley, Vice-Mayor Jim Shulman and Police Chief Steve Anderson. The event kicked-off with a welcome from Belmont University President Dr. Bob Fisher and was emceed by council member Sharon Hurt, a graduate of Belmont’s masters program in nonprofit leadership. The keynote speaker for the event was Rodney Strong, chairman and CEO of Griffin and Strong, PC in Atlanta, GA. He currently serves as the principle for projects dealing with public policy consulting. Strong conducted a disparity study for the Metro Nashville government that looked at the status of Metro utilizing female- and minority-owned companies. Belmont hosts the Metro Council Minority Caucus each year.